Powers/Abilities: Though he has no super powers of his own, Stunt-Master is a trained stunt-man who often uses specially designed motorcycles. His Harley-Davidson 1200 cc Custom Special with 6-speed overdrive transmission is equipped with hover jets and can accelerate to over 200 mph. He wears a Kevlar suit and helmet to maximize protection against fire and physical damage. (Daredevil I#58 (fb) – BTS) – A little-known Hollywood stuntman seeking to make a name for himself, Stunt-Master was hired by Crime-Wave to attack Daredevil at the United Fund Parade. He specially equipped his motorcycle with jets. (Daredevil I#58 (fb)) – Stunt-Master rushed on his motorcycle toward the float the hero was on, sending pedestrians scattering. He tried knocking Daredevil off the float, but Daredevil ducked. Stunt-Master recovered and turned to attack, but Daredevil leapt on the back of the motorcycle and hung on. 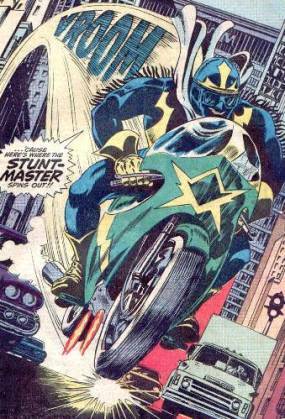 Stunt-Master hit Daredevil in the head with his reinforced helmet, then activated the jets on his motorcycle, sending them speeding through the air. Frustrated that Daredevil was still there, Stunt-Master was thrown off when his motorcycle overturned. Stunt-Master lay still, fearing he'd broken something. (Daredevil I#58) – Prosecuted by Matt Murdock and Franklin "Foggy" Nelson, and with Karen Page and Willie Lincoln watching, Stunt-Master was found guilty and sentenced to jail. (Daredevil I#64 (fb) – BTS) – Stunt-Master was released on a technicality. He relocated to California, determined to go straight. (Daredevil I#64) – Stunt-Master, on his way to a job interview, was nervous when he saw Daredevil jump past. He soon interviewed with Mr. Ellis and got a job as a stuntman on a new motorcycle epic, and was told to return for work in a week. He was thrilled and hooted with pleasure, glad that Ellis didn't see his toupee fall off. A week later, he returned and overheard Ellis and his men, including Jake, planning a robbery. Stunt-Master threatened to expose them, but Ellis drew a gun and told him he would help or be implicated in the crime anyway. On his original cycle, Stunt-Master sped to complete the robbery, determining to go straight afterwards. As he rushed away with his bounty, Daredevil attacked Stunt-Master, who tried dislodging the hero with his jets and by running the cycle over a billboard. They landed and Daredevil convinced Stunt-Master that it wasn't too late to go straight. They switched costumes and Daredevil, as Stunt-Master, returned to Ellis, who took him via truck back to his headquarters with Stunt-Master as Daredevil riding on top the truck. They learned the man from who'd Stunt-Master had stolen was the mastermind behind things, then teamed up to take down the villains. The police arrived, the villains were arrested, and Stunt-Master was proclaimed a hero. He was soon given his own show, to debut that fall. (Daredevil I#67 (fb) – BTS) – Stunt-Master got a makeover and some new hair, and his show was picked up by producer, Ray Stevens. Stevens hired Karen Page to be in the pilot and got Daredevil to agree to be in the first show. (Daredevil I#67) – After rehearsing his first take, Stunt-Master went back to his trailer for extra padding, and was knocked unconscious by Stilt-Man. After Daredevil defeated Stilt-Man, Stunt-Master was released and they finished filming, including his love scene with Karen. (Ghost Rider II#9) – While signing autographs for clamoring fans, Stunt-Master saw Ghost Rider (John Blaze) pursuing the One-Man Zodiac, both on motorcycles. He rushed off to help, desiring greater adventure, and got the reluctant Ghost Rider to agree to his help. Doing a stunt, Stunt-Master dislodged the One-Man Zodiac, who was in the guise of Taurus, off his bike. The villain changed to Scorpio and captured Stunt-Master and Ghost Rider with a blast from the Zodiac Key. They woke up in restraints before Zodiac, in the guise of Aquarius, and the demon Slifer, who explained their villainous plots. Ghost Rider freed Stunt-Master, who attacked Zodiac, but the villain shifted to Cancer and pinned Stunt-Master under his pincers. Ghost Rider freed himself and fought the demon, then ran off to pursue the One-Man Zodiac, leaving Stunt-Master behind to tend to his broken ribs. (Ghost Rider II#10) – Blaze visited Stunt-Master in the hospital and was offered a job as a stuntman on Stunt-Master's show. After Roxanne Simpson visited, Stunt-Master told them about a cycling contest with a cash prize. (Ghost Rider II#13) – Blaze decided to accept Stunt-Master's job and appeared on the television set, where he met Karen Page, Charles Delanzy, the studio owner, "Coot" Collier, the show director, and Katy Milner, Karen's stand-in. They showed Blaze the planned stunt just as the Trapster attacked, trying to kidnap Karen, but Blaze, as Ghost Rider, saved her. (Ghost Rider II#14) – During Blaze's first stunt, the accountant Cosgrove stopped the action since Blaze wasn't a member of the union. Stunt-Master and Blaze were heading off for coffee when the crowd, influenced by the Orb, attacked, but Ghost Rider stopped them. Stunt-Master had to get medical attention for his inflicted injuries. (Ghost Rider II#15) – The stunt got interrupted by the Orb yet again, but Karen was kidnapped this time. A furious Ghost Rider batted Collier aside. Collier and Stunt-Master drove through the gate after Blaze, determined to help him out against Orb. They arrived just in time to pull Blaze off of the defeated Orb. (Daredevil I#138 (fb) – BTS) – Death's Head contacted Stunt-Master and forced him to steal records and kidnap Karen Page for him. Overcome with fear, Stunt-Master agreed. (Ghost Rider II#18) – Stunt-Master stole the records and was approached by Death's Head once again. (Ghost Rider II#19) – Stunt-Master chased down Karen and knocked hero out with a sleeping gas. He then took her back to Death's Head, who Karen claimed was her dead father. (Avengers Assemble I#14AU (fb) - BTS) - George Smith attended the housewarming party of the Champions. (Daredevil I#138) – Stunt-Master followed Johnny Blaze to beg for his forgiveness, but he waited until Johnny was alone. When Stunt-Master finally approached him, Blaze turned into Ghost Rider and melted Stunt-Master's cycle, making Stunt-Master think Blaze had a flamethrower on his bike. Stunt-Master got Ghost Rider to listen and promised to show him to where Death's Head's headquarters was. He rode on the back of Blaze's motorcycle until they arrived, finding Daredevil battling the villain. (Ghost Rider II#20) – After Death's Head (secretly Death-Stalker) fled, Stunt-Master apologized to Karen and told her that he was planning on spending some time riding alone to reassess things. He contemplated starting the show over when he returned. 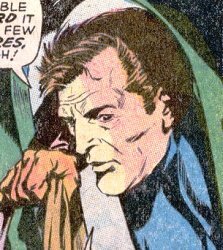 (Ghost Rider II#22) – Stunt-Master watched Blaze film a stunt scene admirably, then introduced Blaze to Carson Collier. (Ghost Rider II#23) – Roxanne and Stunt-Master dropped by Blaze's apartment to share their concerns over Coot's distant behavior lately, but Blaze seemed distracted with his own problems. An angry Stunt-Master walked out on him. (Ghost Rider II#25) – Stunt-Master, Coot, Karen, the rent-a-cop Armstrong, Roxanne, Blaze, and others gathered to watch the police have a stand-down with Malice on television. When the power went out, they scattered, unable to film that night. (Night Thrasher II#21 - BTS) - At some point, Delazny Studios merged with Imperial Pictures, formerly Prince Namor's S.M. Studios, wherein George Smith became a high-level executive, possibly even the head of the company. In this role, he evidently had a hand in the creation of Ballistic Storm Risin', a trashy but popular action film whose fan base included Elvin Haliday (Rage), the ward of Night Thrasher. 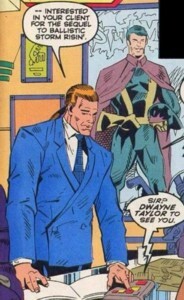 (Night Thrasher II#21) - In his office at Imperial/Delazny's New York headquarters (which prominently displayed one of his old Stunt-Master publicity posters), Smith was holding a meeting with talent agent Sammy Samuels and his client, an upcoming young actress named Janet Glass, regarding a role as the female lead in the Ballistic Storm sequel. His intercom then buzzed, informing him that Dwayne Taylor, the young multimillionaire who was the studio's new owner, wished to speak with him. Seeing no problem with schmoozing with the new boss, Smith quickly invited him in, introducing Taylor to Samuels and Glass. With introductions over, Taylor insisted on speaking with Smith alone, unaware that Samuels hung back to listen in on their conversation. Smith then learned that Taylor was intent upon discontinuing the Ballistic Storm series, citing a young friend of his had been influenced into running away from home and becoming violent, a discreet reference to Rage, who had adopted the titular hero's methods in cleaning up the drug trade on the streets. 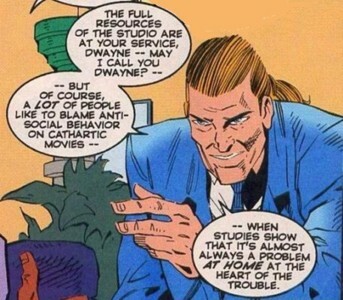 After Taylor also asked for materials on the Storm character as well as the movie's villain, Phat Chance, in the hopes of guessing Elvin's next move, Smith acquiesced, but noted that often anti-social behavior was blamed on popular entertainment when studies showed it could often be traced to problems at home. Unwilling to recognize his own actions as Night Thrasher having been an influence, Taylor flatly denied that such was the case in this instance. 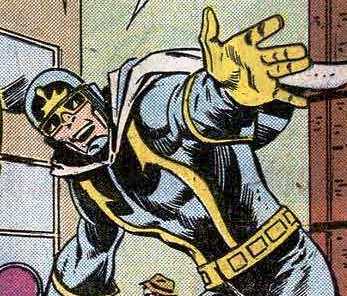 (Avengers III#10) – Stunt-Master and Chili Storm were invited to host the Avengers Day parade. He took the opportunity to talk about the cycle shows he was putting on throughout the country. As the Avengers' float went by, they cheerfully talked about the history of the Avengers, the members, the villains, and the almost members. They turned the time over to Megan McLaren for coverage of the dead Avengers. They were all horrified when the Grim Reaper attacked, putting up an impenetrable shield over the Avengers (Captain America, Firestar, Goliath, Iron Man, Justice, Thor, Vision) to fight them. (Avengers III#11) – When nothing could break the barrier, Stunt-Master got on his jet-powered cycle and tried to crash through it, with disastrous results. The Fantastic Four (Human Torch, Invisible Woman, Mr. Fantastic, Thing) stopped him from crashing to the ground. (Avengers Assemble#14AU) - Natasha Romanoff visited the Champions' old business manager Richard Fenster in San Francisco and they had a coffee with George Smith. (Daredevil IV#12 (fb) - BTS) - George Smith aged and had a lot of long-term injuries. He grew bitter about his losses and missed being famous. He began to form a plan to steal the 'man without fear' nickname from Daredevil. Getting funding from Leveron Pharmaceuticals, he hired a new Stunt-Master, who would lure homeless men in as stunt doubles and kill them in accidents, letting the public think that Stunt-Master was indeed defying death. Daredevil moved back to San Francisco, opening a law practice with Kirsten McDuffie, and Smith began taking pills that would disguise his heartbeat so he could lie to Daredevil. (Daredevil IV#11) - George Smith visited Matt Murdock and Kirsten McDuffie, saying he wanted to sue the new Stunt-Master, who soon planned a large stunt. Smith faked his own suicide, then surprised Daredevil later by being bound on the bike, making the hero think Smith had been kidnapped. (Daredevil IV#12) - Smith, bound on the bike, planned on Daredevil being killed in his rescue attempt, but Daredevil escaped unscathed and rushed Smith to the hospital. As Daredevil confronted the new Stunt-Master, Smith revealed to Kirsten McDuffie that he was behind it all. Daredevil aided in Smith's arrest, and promised Smith he would be in jail for a long time. Comments: Created by Roy Thomas, Gene Colan, and Syd Shores. Stunt-Master was popular enough that Gary Friedrich pitched Roy Thomas on a motorcycle hero named Ghost Rider, and that only later did they add the supernatural bits to his origin. Of course, there's conflicting stories over the exact genesis of the motorcycle riding Ghost Rider, but the constant is, Stunt-Master paved the way for Ghost Rider to be approved, which made his appearances in Ghost Rider a nice little meta joke. In issue 490 of the original Adventure Comics series in 1982, Stuntmaster -- super stunt-cycle and all -- was among the heroes its "Dial H for Hero" feature became. Aside from a laser-firing scepter, the character was an exact copy of the Marvel character, practically just recolored red. Dwayne Taylor's acquisition of Imperial/Delazny was a call back to "Money Don't Buy", a four-part story arc that Kurt Busiek wrote when he was brought aboard NIGHT THRASHER's creative team with issue 15. The story concerns Night Thrasher bullishly deciding to take bigger steps to take down the criminal element by using his wealth and position as Dwayne Taylor to simply buyout the legitimate businesses that are either used by or are the fronts for criminal operations, and simply ordering the illegal activities ceased. It's not one of Kurt's more inspired stories, as the idea simply peters out in the second half as Night Thrasher engages in some globe-trotting adventures in South America and Africa as a result of his actions. It does give a plausible explanation why super-hero/millionaire playboys in comics a la Iron Man and Batman don't regularly do this (aside from the fact that the affected criminals would seek retribution), as Thrasher's tactics require committing fraud, violating the Interstate Commerce Act, etc., all of which an attentive law-enforcement agency (&ast;cough&ast; S.H.I.E.L.D. &ast;cough&ast; &ast;cough&ast;) would catch them doing. The two-part "Heart of Rage" story during which George Smith makes an appearance is very much an improvement. It continues elements of "Money Don't Buy" in that Taylor learns Imperial/Delazny was among the corporate holdings of businesses he purchased without even knowing it, making him owner of the very movie he despises. Aside from that, the story goes into the relationship between Dwayne/Night Thrasher and Elvin/Rage, their influences upon one another, their communication problems...basically it's the Batman-and-Robin story that Kurt had apparently been waiting for somebody to write for some time. It doesn't hurt that we see the former Stunt-Master again after a nearly ten year absence, displaying Kurt's abilities, just like Mark Waid and Gruenwald, to recall and bring back esoteric characters at opportune moments. Thanks to AstroCitizen for adding Night Thrasher II#21. (Daredevil I#64 (fb) – BTS) – Mr. Ellis entered a deal with Jake, and others, to feign the theft of a priceless film. They decided to manipulate Stunt-Master into stealing it for them. (Daredevil I#64) – Ellis interviewed Stunt-Master for a part in a new motorcycle movie and hired him, telling him to return in a week. Stunt-Master returned and overheard Ellis and Jake talking about their ruse. He threatened to expose them, but Ellis drew a gun and promised to implicate Stunt-Master in the crime if he didn't help them willingly. Stunt-Master robbed the film from its courier, secretly Ellis' ally, then tangled with Daredevil. Stunt-Master soon returned to Ellis, claiming that Daredevil was dead, and they went back to Ellis' headquarters. There, they learned that it was Daredevil hiding in Stunt-Master's costume. Joined by Stunt-Master in Daredevil's costume, the heroic duo defeated Ellis, Jake, and the others. The villains were soon arrested. (Night Thrasher II#21) - An aspiring young actress, Janet Glass was trying to keep awake (or not develop a migraine) during a meeting between studio exec George Smith and her agent, Sammy Samuels, when Dwayne Taylor stopped by unexpectedly. In the brief meeting that followed, Janet and Dwayne displayed some apparent interest in one another until it was explained she was being auditioned for the female lead in the next Ballistic Storm movie. Samuels then quickly escorted himself and Janet out so that Taylor and Smith could have their meeting together, Janet apparently confused by Taylor's sudden change in demeanor at the movie's mention, but willing to give the businessmen time to talk alone. Note: As Night Thrasher's relationship with Silhouette Chord had hit a sour note at this time, it is possible that Janet was introduced as a possible new love interest, but the book's cancellation ended any further plot or character development in that direction. (Daredevil I#64) – Stunt-Master overheard Ellis and Jake talking about their ruse. He threatened to expose them, but Ellis drew a gun and promised to implicate Stunt-Master in the crime if he didn't help them willingly. Stunt-Master robbed the film from its courier, secretly Ellis' ally, then tangled with Daredevil. 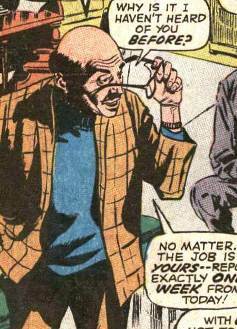 Stunt-Master soon returned to Ellis, claiming that Daredevil was dead, and they went back to Ellis' headquarters. There, they learned that it was Daredevil hiding in Stunt-Master's costume. Joined by Stunt-Master in Daredevil's costume, the heroic duo defeated Ellis, Jake, and the others. The villains were soon arrested. (Night Thrasher II#21) Janet Glass' agent, Sammy Samuels had been invited to a meeting with Imperial Studios executive George Smith, who was interested in his client appearing as the female lead in the sequel to Ballistic Storm Risin'. The mutual hogwash session was curtailed when Dwayne Taylor, who had recently acquired the studio in a series of corporate buyouts, stopped by. In the brief meeting that followed, Samuels introduced himself and his client, explaining that "Sammy" was just a nickname, before vacating the area to let the two executives talk in private. Hanging back to listen in, however, Samuels was surprised to learn that Taylor wished to discontinue the Ballistic Storm series. 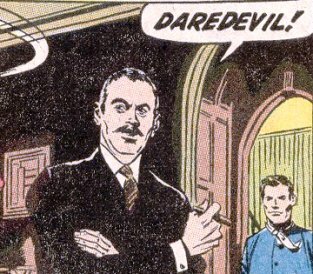 (Daredevil I#67) – Ray Stevens, a Hollywood producer, took on the Stunt-Master television pilot. He hired actress Karen Page and asked if she could contact her old friend, Daredevil. Daredevil showed up at Stevens' office and Stevens offered Daredevil $50,000 to work on the pilot with them. After Daredevil figured out there was no one watching them as he'd supposed, they started filming. After Daredevil defeated the attacking villain, Stilt-Man, they finished up the shooting. Stevens promised Page a big future in film. (Daredevil I#70) – Stevens got Karen an audition for a leading role with famous actor, Buck Ralston. They attended Ralston's political rally and Stevens had to shake Karen from her thoughts when Ralston approached. He told her that this role could make her famous, and was embarrassed when she told Ralston that his political beliefs were a bit extreme.